More work done. Nothing else will be done until probably mid summer when the little one is settled in. Ah yes the bump down feature. I forgot about that. The bumper trolley needs a little work. Madison Hardware Story car came in a couple of weeks ago. Great artwork. The book was great too. 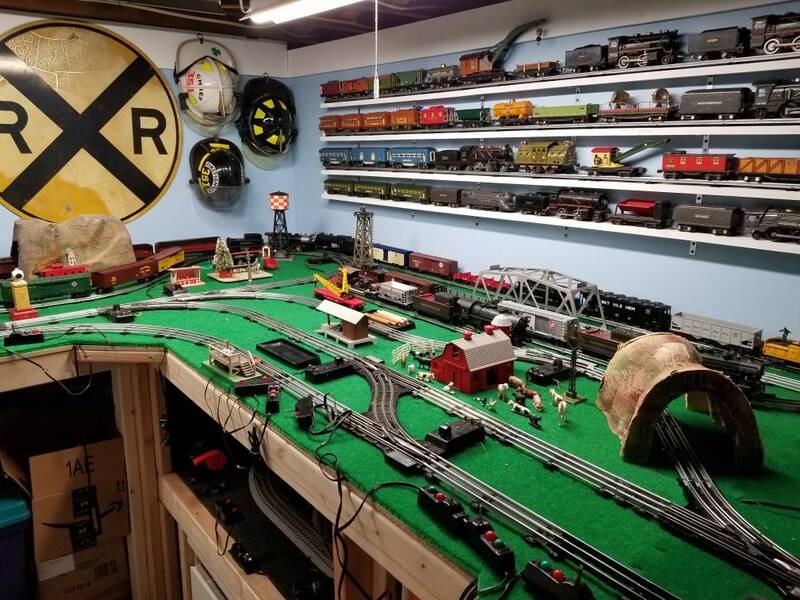 Train show season is right around the corner. Greenwich CT is the next one I will be going to. Lots of prewar stuff and good vendors. September 23! The only thing I like about the cold is that train show season is here! Can't wait to see if I can get a 263E and tender and not get robbed. A Freind of mine setup. This train came yesterday. One of the things I love most about prewar trains is that they still work without circuit boards and electronics,best of all they are all made in America! Also the second picture shows a test track my son and I built last night. The yard master doing her goodnight inspection.